An ultra-durable case that provides maximum protection for up to 5 liters of product, making it ideal for smaller sized medical equipment. With Pick N Pluck™ foam, customize it to almost any shape for 360° of equipment protection. An ultra-durable case that provides maximum protection for up to 27 liters of product, making it ideal for medium sized medical equipment. With Pick N Pluck™ foam, customize it to almost any shape for 360° of equipment protection. An ultra-durable case that provides maximum protection for up to 9 liters of product, making it ideal for smaller sized medical equipment. With Pick N Pluck™ foam, customize it to almost any shape for 360° of equipment protection. 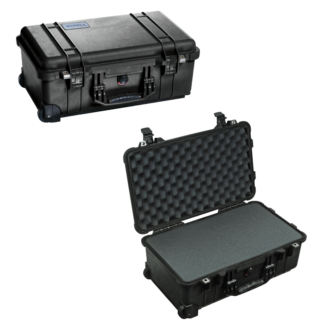 The 5L Medical Equipment Response Case (MC-MERC-005L) is a crushproof, dustproof and water tight case that provides maximum protection for contents, making it ideal for valuable medical equipment. The airtight, unbreakable, Pelican case, combined with a tamper seal lock and custom labeling, makes storing and transporting equipment quick and easy. Pack-up valuable equipment and be ready to respond. It features strong, lightweight, solid walls, Pick ‘N Pluck foam, easy-open, double-throw latches, complimentary alphanumeric identification labeling, and a lifetime guarantee. Fold-down handle for easy portability.